Alan Rudolph has often said that The Moderns—his fractured, dreamlike fable about life, love, and art in 1920s Paris—was the first movie he ever wanted to make; it just took him 11 features to prepare for it. Rudolph began making movies in 1972 and retired in 2002; released in 1987, at the exact halfway point of his career, The Moderns is his centerpiece. Most of his films can be split into two categories: the pre-Moderns, which saw Rudolph gradually developing the romantic, atmospheric style—heavy on visual rhymes, choreographed zooms, and neon lighting schemes—that would find its fullest expression in that movie, and the post-Moderns, which would find Rudolph developing the movie’s themes individually. Mrs. Parker And The Vicious Circle fits squarely into the latter category. 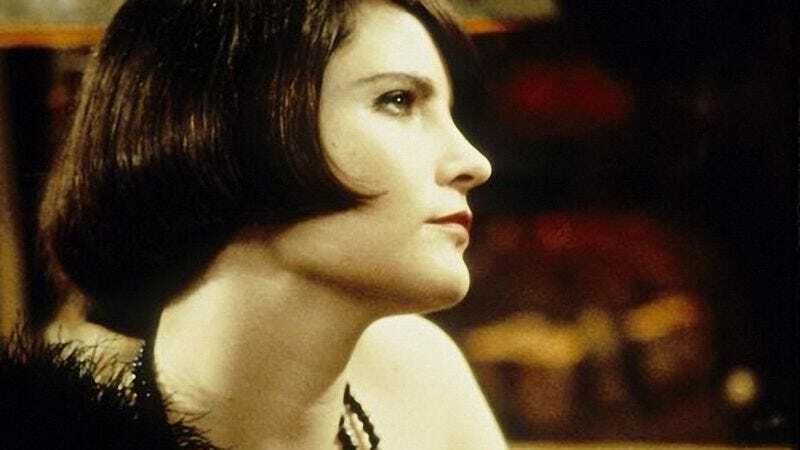 Returning to the Jazz Age—though this time in New York—Rudolph centers the movie on writer and critic Dorothy Parker (Jennifer Jason Leigh, speaking with a scrunched, halting voice) and her platonic relationship with humorist Robert Benchley (a charismatic Campbell Scott). Rudolph spent a while as Robert Altman’s assistant director in the 1970s, and Mrs. Parker is his most overtly Altman-esque film, full of overlapping conversations, slow zooms, background noise, and muttered asides. The film’s stylized construction, however, couldn’t be farther from Altman. Mrs. Parker is a film of loose conversational scenes, arranged with a clear order, like chapters in an impressionistic memoir. The result creates an immersive, claustrophobic sense of creative life in the era of the Algonquin Round Table, without losing sight of the artistic and personal frustration underneath its protagonist’s non-stop wisecracks. It’s a movie about a person being lonely in public—a touching, deeply sympathetic portrait of an artist who can never express her strongest feelings, and a great introduction to one of the most imaginative and unjustly neglected American filmmakers of the era. Availability: Mrs. Parker And The Vicious Circle is available from Amazon Instant. The pricey, out-of-print DVD can be obtained from Netflix or your local video store.